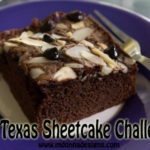 Texas Sheet Cake has to be the most delicious, heavenly dessert. I remember this decadent chocolate dessert from my childhood, so I wanted to find a similar recipe. Even though it is not gluten free, I tried this version of this chocolate dessert hoping it was the perfect melt-in-your-mouth recipe. Brighten Your Photos Using bounced light can be tricky, but this article by LightStalking offers some helpful hints. Their article on making photos pop, teaches you how to use bounced light to your advantage. They also include beautiful examples of using their on-camera flash to create beautiful images.